Thai police come in for a lot of ridicule and scorn by locals. They are variously seen as corrupt (random road stops to extract a few hundred baht in ticketless “fines”) and lazy (recent campaign at a force-wide weight reduction as there were too many tummies stretching the already skin-tight brown uniforms) by many residents. There is no doubt that some members of the force aren’t the most outstanding examples of fine police work. That’s probably true of any police force. There are plenty of other members of the Thai police who, despite long hours, low pay and terrible working conditions (traffic police have the highest incidence of lung cancer in the country), do their best to keep traffic moving on the choked roads. 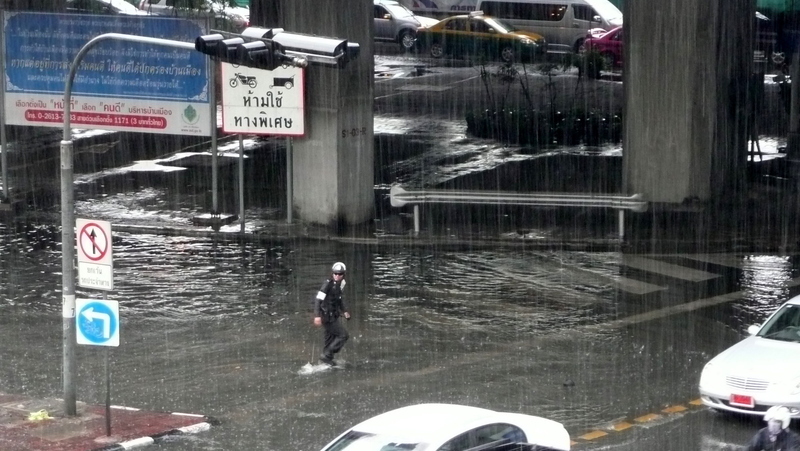 It was on a rainy Friday afternoon a few weeks ago that I caught this snapshot of a traffic policeman, slogging through the recently-formed lake that was the expressway entrance toll plaza on Ploenchit / Rama I Road. No doubt he was earning ever last satang of his salary that day. This entry was posted in Uncategorized and tagged Bangkok, Krungthep, Police, rain, Thailand, Traffic by christao408. Bookmark the permalink. Chris, where do you work again? This is like 3 steps away from my office! kudos for those doing their jobs. Whoo-hoo wading!! 😀 I bet he was having fun, he just wasn’t allowing himself to show it. You live in Thailand? (or are you Thai??). That is WICKED cool! 😀 😀 I’m guessing you must know how to make a mean Tom Yum. @Poom – I work from home, but I was heading to a meeting at Q House Ploenchit. The raining photo reminds me of the flood in Georgia, and I started wondering why the policeman was in the rain.Eventually all these thoughts took the back seat to…men in uniforms are really hot…Thanks. Thank you Chris, for a productive Wednesday work morning. My admiration for the men and women in uniform has always been super high. So many times we only hear about the corrupt or lazy ones and the best of the best are still showing up and taking the heat. We are all lucky to have them out there protecting us. I lost my train of thought while reading Jason’s comment. lol…It looks like it’ll take awhile to dry out his shoes / boots. Do most folks have an extra pair of shoes / sandals just for these rainy days? I wouldn’t be able to resist the opportunity for world-class puddle jumping that such an environment word afford. @ElusiveWords – Tawn often carries a pair of flip-flops, just in case. @moptoplop – Impossible to resist, yes. That is one great photo Chris. I agree with you about the tropical rains versus the winter snow and ice. @christao408 – kudos to that too! @ZSA_MD – It was one of those spur-of-the-moment photos and I’m lucky I had my camera with me. Haha~I still remember seeing those policemen wearing tight brown colour uniforms, and also witnessed a “fine” (bribe), in which a taxi driver paying some cash to a traffic cop! RYC: Hi, Chris, definitely! I will admit, I thought District 9 was going to be a bunch of aliens who wanted to take over the earth because the film’s trailer was pretty cryptic. But as the plot thickened, every scene kept us in suspense. I squirmed and winced a lot and was even stressed out. But as the movie came to an end, my husband and I were amazed and enjoyed the film. I really recommend District 9, but it may not be the same for everybody. I hope you and Tawn can get the chance to see it and do a review. Flooding is so common even in the city!That surprised me the first time I saw it in Bangkok! @ZenPaper – We’re a very low-lying city, similar to New Orleans. A guy I met who is a civil engineer specializing in water management, explained that the city does pretty well handling the rains, considering the circumstances, but that even the best water management can’t overcome the immense quantity of rain and the negative elevation. @swcheng15 – Glad you like it. @CurryPuffy – Taxi drivers and motorcycle drivers are easy targets. @teachersgathering – We did see the film this past week and really enjoyed it. Entertaining, thought-provoking, allegorical. Well worth our two hours.